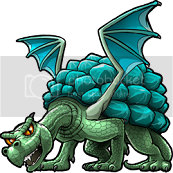 In order to participate in the dragon feature you are going to need some Dragon Scales. 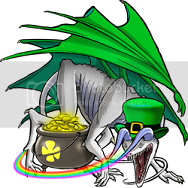 - Completing Cash Offers that pay in Dragon Scales. 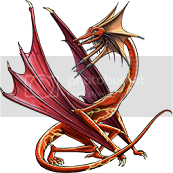 - Completing Daily Surveys and forming Dragon Scale Chain Bonuses. - Productively talking in the Treasure Trooper Chat Room for an hour straight for 2 Dragon Scales, once a day. - Winning an Hourly Contest in the Treasure Trooper Chat Room that has a prize of 3 Dragon Scales. - Patting Someone on the Back in the Treasure Trooper Chat Room for 1 Dragon Scale, three times a day. - Winning a Dragon Scale on the Jungle Slots. - Converting Arrowheads or Cash in to Dragon Scales. 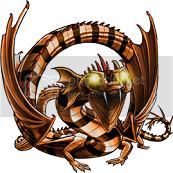 Once you have accumulated Dragon Scales you are now ready to visit Cogg's Coop for all your dragon essentials and necessities, as well as the Dragon Lair to begin your interactive dragon journey. 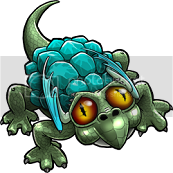 You only have to purchase the Egg Nest once but you must purchase an Egg Nest before you can purchase any Dragon Eggs. 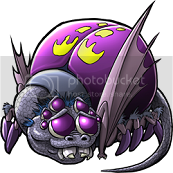 After you have purchased an Egg Nest you can begin purchasing Dragon Eggs. The Egg Nest holds a maximum of five Dragon Eggs at one time. If you attempt to purchase an egg/breed an egg while maximum occupancy has already been reached, you will be prompted with this message, "Looks like your nest is full. Hatch some of your eggs to make room!" Special Note: Dragon Egg images are completely random and have nothing to do with what dragon is awaiting inside. You must incubate a Dragon Egg for 96 hours in order for it to hatch. You can do this by purchasing 12 Heat Lamp Bulbs, per egg. Each Heat Lamp Bulb will last for 8 hours and you must wait for the full 8 hours to pass before you can apply another one. A Dragon Egg cannot hatch from Heat Lamp Bulbs alone. It also needs 25 Human Touches. will present you with a code that can be used on forums/message boards that allow it. will present you with a code that can be used on Facebook. will present you with a code that can be used in emails to friends/family. Special Note: You cannot post Dragon Egg Banner links on any official Treasure Trooper property: Forums, Chat Room, Official Treasure Trooper Facebook Group, Jack Amazon's Facebook, or Treasure Trooper's Twitter. You must accumulate your Human Touches outside of Treasure Trooper. Once your Dragon Egg has successfully reached 00:00:00 Incubation Hours and 0 Human Touches, you are now ready to hatch your dragon. 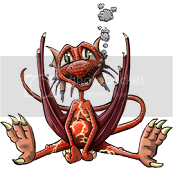 If you hatch more dragons from your Egg Nest then your Dragon Cave has enough room for, you will be given this message: "OOPS! Your egg cannot hatch until there is room in the Dragon Cave for the baby to live! 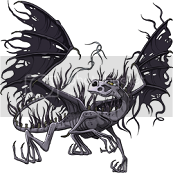 Visit Cogg's Coop to upgrade your Dragon Cave." Nothing bad will happen if you receive this message. Your dragon will simply stay in the Egg Nest until you have enough room in your Dragon Cave to hatch it. Dragon Food is used to feed Baby/Adolescent Dragons. You must feed Baby/Adolescent Dragons at least once every 24 hours. 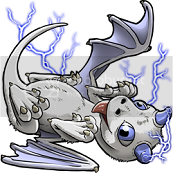 It is recommended to feed your Baby/Adolescent Dragon at least 5 minutes before the timer reaches 24:00:00. If you forget to feed your Baby/Adolescent Dragon it will moved to the Medical Station for Malnutrition. Special Note: Administering a dose of Dragon Medicine will count as Dragon Food for that dragon, meaning you will have 24 hours from the time you heal it before you must feed it again. Once you click Feed, your Baby/Adolescent Dragons last feeding timer will reset to 00:00:00 and begin counting upward. It can take a few seconds before the timer resets to zero. 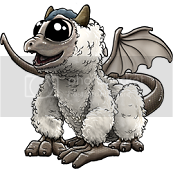 It takes 168 hours in the Dragon Cave for a Baby Dragon to become an Adolescent Dragon. 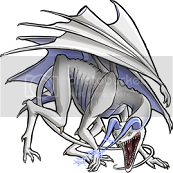 It takes 168 hours in the Dragon Cave for an Adolescent Dragon to become an Adult Dragon. Any time your dragon spends in the Medical Station due to Malnutrition does not count towards the 168 hours your Baby/Adolescent Dragon needs to mature. Using a Growth Hormone is an easy way to advance your dragon to the next growth stage. 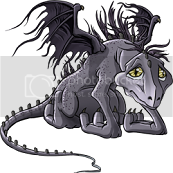 If you have a Baby Dragon and use a Growth Hormone, your Baby Dragon will become an Adolescent Dragon. 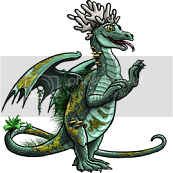 If you have an Adolescent Dragon and use a Growth Hormone, your Adolescent Dragon will become an Adult Dragon. 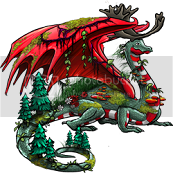 Dragon Food and Growth Hormones are your only two options when it comes to growing a dragon. Regardless of which ever one you choose, you will be alerted when your dragon becomes an Adolescent and when your dragon becomes an Adult. Once your dragon has become an Adult Dragon, you no longer have to worry about feeding it. You now instead get to focus on raising its trust. The higher the trust your Adult Dragon has, the more you will be able to do with it. The most common way to raise your Adult Dragons trust is by choosing to Interact with it. 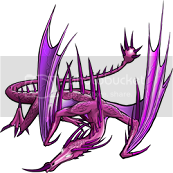 You can Interact with your Adult Dragon once every 3 hours, but be advised that finding its Hate or Dislikes may send it to the Medical Station for Depression. If this happens, your Adult Dragon's trust will only be at 1% once you Heal it. Finding its Love will raise its trust 10%. Finding one of its Likes will raise its trust 5%. Finding some thing it finds Neutral will do nothing. Finding one if its Dislikes will decrease its trust by 20%. Finding its Hate will decrease its trust by 30%. 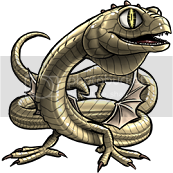 Plucking scales from an Adult Dragon, Breeding two Adult Dragons, and sending an Adult Dragon to the Medical Station for Depression, are also considered an Interaction and will require you to wait 3 hours afterwards before you can use one of the above 9 Interactions. Special Note: If you do not Interact with your Adult Dragon for 36 hours, it will lose 5% trust. A Dragon Treat raises an Adult Dragon's trust by 20%. 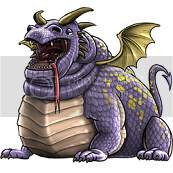 After you click on Give Treat the screen will load to the Interaction screen showing your Adult Dragon with 20% more trust then it previously had, as well as display this message, "YourAdultDragonsName gobbles up the treat! You are rewarded with a loud burp." The Medical Station is basically a dragon's second home. The more active you are in all the dragon areas available, the more familiar you will become with the four ways your dragon can end up in the Medical Station: Malnutrition, Depression, Lost Battle, Quest Trauma. 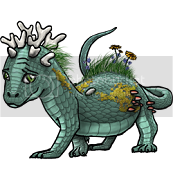 Each time your dragon ends up in the Medical Station you must buy a dose of Dragon Medicine to Heal it before you can use that dragon actively again. allows you to pull Dragon Scales from your Adult Dragon. allows you to Sell your Adult Dragon for its cash value. Each time you pull a scale from your Adult Dragon, your Adult Dragons trust drops by 10% for the total number of scales pulled. Special Note: You can only pull a maximum of 9 scales total from each Adult Dragon and it is your responsibility to keep track of how many you have pulled. 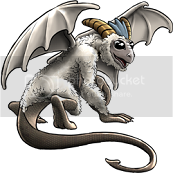 Harvesting an Adult Dragon will result in all your other Adult Dragons within the Dragon Cave losing 25% trust. It is important for you to make sure all your Adult Dragons have a high amount of trust before you Harvest one, otherwise you may end up with Adult Dragons in the Medical Station for Depression. Your Adult Dragon must have at least 50% trust to be Harvested. 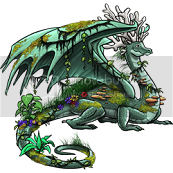 If you attempt to Harvest your Adult Dragon with a lower amount you will be prompted with this message, "YourAdultDragonsName does not trust you enough to let you approach him/her with a knife right now. Raise his/her trust level!" 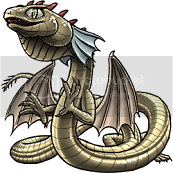 Selling an Adult Dragon will result in all your other Adult Dragons within the Dragon Cave losing 25% trust. It is important for you to make sure all your Adult Dragons have a high amount of trust before you Sell one, otherwise you may end up with Adult Dragons in the Medical Station for Depression. Your Adult Dragon must have at least 90% trust to be sold. 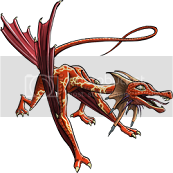 If you attempt to Sell your Adult Dragon with a lower amount you will be prompted with this message, "YourAdultDragonsName does not trust you enough to let you transfer ownership over to Professor Cogg." You may only Sell one dragon, per 30 days. If you attempt to Sell a dragon before the full 30 days has passed you will be prompted with this message, "You have recently sold a dragon. You may only sell one every 30 days." 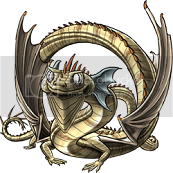 Special Note: The only way to know how much time has passed since you previously sold an Adult Dragon is for you to keep note of the exact date and time you sold it. It is your responsibility to keep track if you wish to know. 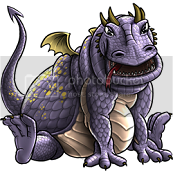 Your Adult Dragons must have at least 75% trust in order for them to access the Breeding Pit. Also, the Adult Dragons you choose to Breed lose 30% trust after they produce a Dragon Egg. There are 12 possible dragon species on Treasure Trooper. 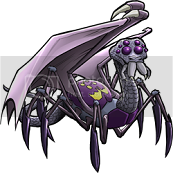 Tier 1 dragons are the most common, as they are the ones you purchase from Cogg's Coop. 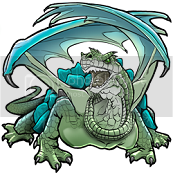 Tier 2, Tier 3, and Tier 4 dragons are only available through breeding. It will take some time, dedication, and lots of patience to find the right dragon pairs to breed to produce one of these Tiers. 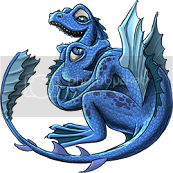 Special Note: The Adult Dragon pairs needed to Breed a Tier 2, Tier 3, and Tier 4 are a secret and are not allowed to be disclosed. Each member must find them for themselves. 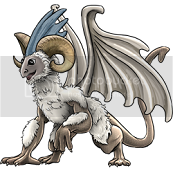 Also, breeding Tier 2, Tier 3, and Tier 4 dragons together does not guarantee you one of the parents species. 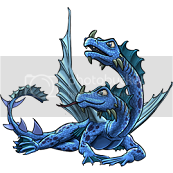 You also have the possibility of breeding a Tier 1 dragon. The Training Grounds allow you to Battle your Adult Dragons against other members Adult Dragons. Each time your Adult Dragon wins a Battle you will receive a reward, as well as be one win closer to reaching the next Level. The reward varies depending on what Level your Adult Dragon is on. Each time your Adult Dragon loses a Battle, it goes to the Medical Station for a Lost Battle. You may only battle one Adult Dragon on Level 4 and one Adult Dragon on Level 5 once every 24 hours exactly. 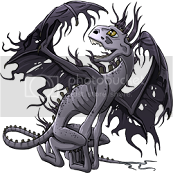 If you try and Enter Battle before the full 24 hours has passed, you will be prompted with this message, "Sorry, this dragon is too tired to fight again so soon. Please try back tomorrow or enter a different dragon into combat!" will allow you to see that last Battle that was fought by the Adult Dragon you previously clicked the Fight button for. Special Note: Entering into a Battle that does not have an opponent can result in waiting many hours. When this happens it leaves members unsure of whether their Adult Dragon has fought or not. 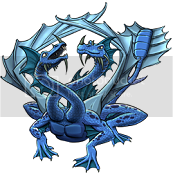 The best way to know for sure is for you to keep track of how many Wins and Losses your Adult Dragon has when you Enter Battle, since one of the two will increase after you have fought an opponent. It is your responsibility to keep track if you wish to know. Dirty Tricks and Enhancements help provide a little something extra to bring in to Battle. Before you click Enter Battle, you will have the option to select one Enhancement, one Dirty Trick, or one of both to bring in to Battle with you. Once you have an Adult Dragon opponent, the items you chose will automatically be used as the Battle plays out, if the possibility arises. Some Battles are time sensitive and may not trigger the use of a Dirty Trick or Enhancement you chose to bring in to Battle with you, this however, does not stop them from being considered as used. Special Note: If you win a Battle in which your Adult Dragon opponent has used a Dirty Trick or Enhancement, there is a chance that your Adult Dragon will receive the item and add it to your inventory. 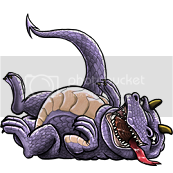 A Training Session will allow you to train an Adult Dragon in one of its dragon stats after it loses a Battle. You can only Train an Adult Dragon after it loses a Battle and has broken Pride. 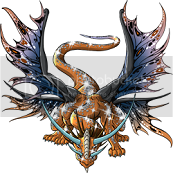 You can only Train an Adult Dragon 10 times per dragon Level, allotting you 50 training sessions per dragon total. 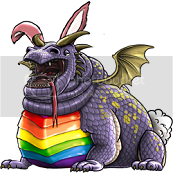 If your Adult Dragon has broken Pride but it isn't allowing you to Train, this means you have already Trained the maximum of 10 times on that Level. If you don't get to Train your Adult Dragon the full 10 times on a Level, your unused Training Session opportunities will roll over in to the next Level until all 50 are used. Special Note: Each member must learn the importance of each dragon stat on their own. 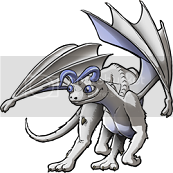 The Quest Portal allows you to send one Adult Dragon on a daily Quest where it can win an item, win a cash prize, or be sent to the Medical Station for Quest Trauma. Awesome new guide nikkums!! I haven't read it all yet, but I know you worked hard on this. Thanks!! Very nice! This will be extremely helpful to everyone wanting to know all about dragons! allows you to Harvest your Adult Dragon for a random amount of Dragon Scales. Special Note: The only way to know the exact total of Dragon Scales you get from Harvesting an Adult Dragon, is for you to keep note of how many Dragon Scales you had before Harvesting and how many you have after Harvesting, then finding the difference. It is your responsibility to keep track if you wish to know. As stated it is a random amount, but when you harvest it does not tell you how much it was hence the special note. Awesome guide! This should be very helpful for everyone. Thank you. Best dragon guide, great work nikkums. 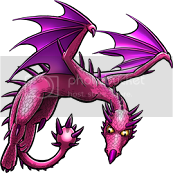 Click on my profile to see my dragons!